To try out the new features, head over to www.haleconnect.com and either log in with your existing account or create a new (30-day trial) account. This option you have selected appears in the metadata step of dataset creation. More information on metadata workflows is available from a recent tutorial. hale connect 1.9.0 makes it possible to reference file attachments from uploaded or transformed data sets. To upload attachments, navigate to the Files section of your data set and click the ‘Upload attachments’ button. To reference the uploaded attachments, your GML source data needs to include the following expression as the value for the attribute which references the attachment: attachment:///<filename>. The filename of the attachment must be identical to the filename in the GML. When the dataset is published, the expression is transformed into a publicly available link to the uploaded attachment file. Much Linked Data, as well as Open Standards Data, uses rich object-oriented models, with many explicit and implicit references between objects (or as the GIS community calls them, features). Such references are hard to navigate and use in a classical, layers-based GIS. We have thus developed a specific client to explore such data sets. The Feature Explorer can be accessed via the GetFeatureInfo client on the WMS map preview for your published view services. The Feature Explorer can be used to explore GML that contains complex features and links to related features. INSPIRE compliant GML often contains links to related features, or codelists, which provide additional information about the feature. To access the Feature Explorer, click on the ‘show Details’ button in the HTML view of GetFeatureInfo client. The Feature Explorer opens in a new tab which displays the attributes associated with the selected feature. Click on any link to further explore the attributes or related features. A ‘+’ button appears to the right of attributes which contain additional levels of nesting. GetFeatureInfo is an optional operation which allows users of your view services to query your WMS layers. The GetFeatureInfo client is only available for WMS layers which have been configured to support the GetFeatureInfo operation. As a theme manager, you can activate GetFeatureInfo for your WMS in the View Services sections of the associated theme. To access the GetFeatureInfo client, click the Map view link in the View Services section of your dataset. Click on any feature in the map preview to view attributes for the selected feature. The GetFeatureInfo client allows you to select the feature layer you are viewing and the display format (HTML, plain text or XML). The app-schema plugin developed at GeoSolutions now comes with support for GeoServer’s isolated workspaces feature. Isolated workspaces allow service providers to restrict access to OWS layers through virtual services. A virtual service exists for each GeoServer workspace and publishes only those layers available on the associated workspace. Once a workspace is set to isolated, the contained layers are no longer visible or queryable by global services. The contents of an isolated workspace are accessible only via the associated virtual service. This functionality is useful for service providers who want to share specific services with different clients. Thanks to the GeoSolutions team, specifically to Stefano Costa and Nuno Oliveira, for this contribution! XtraServer is a product of interactive instruments GmbH. It is a suite of implementations of various OGC service specifications, e.g. Web Feature Service (WFS) and Web Map Service (WMS). XtraServer services can be based on any application schema according to the Geography Markup Language (GML). For this, a mapping from the GML application schema to the table structure of the underlying database is to be provided in the configuration of the service. The mapping language of XtraServer is very flexible and can virtually map all GML application schemas to heavily deviating database schemas. For this reason, mappings can be quite complex. The purpose of this plugin is to transform the XtraServer mappings to hale alignments (via Import) and generate a new XtraServer mapping file easily (via Export). Declarative Mappings, which we call Alignments, lend themselves to be re-used. One potential area of re-use is if you have one alignment that maps from A to B and another one that maps from B to C is that you could combine them into a single alignment from A to C. This is exactly what the Alignment Merger command-line component does - it allows you to merge two alignments that have a shared schema into one. As an example, say you have a mapping from a database to a national standard, and one from that national standard to INSPIRE. Now you can directly create a mapping from your database to INSPIRE, without much extra work! The Alignment Merger will perform as many steps as possible automatically, but will sometimes require manual input from you. For this purpose, the Alignment Merger generates Tasks (see next new feature). Thanks to the Implementierungspartnerschaft AAA-Dienste for funding this work. With the release of 3.4.0, users are able to view and manage tasks that are created by the alignment merger process. This functionality allows users to either dismiss tasks or edit cells directly before transformation. hale studio now supports the option to split GML by feature type during the export of a GML feature collection. This new option is helpful for users who want to reduce their file size or who need to work with GML files containing a single feature type. 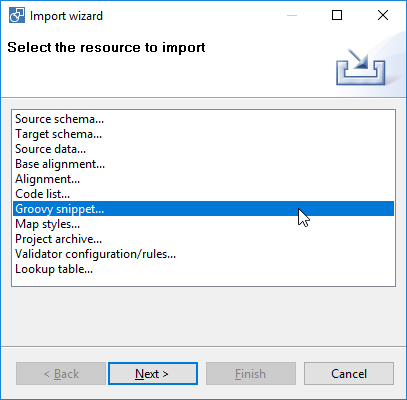 Now you can import Groovy scripts to your transformation project. Using Groovy snippets allows you to keep extensive logic in external files and to easily reuse them across different transformation scripts. You can reference a specific Groovy snippet by its identifier that you set when importing the snippet. The list of presets for source and target schemas has been extended: The newest addition is the AAA (NAS) XML Schema 6.0.1. Users performing transformation of source data using the command line interface in hale studio are now able to set customized success conditions through use of a Groovy script which is evaluated against the transformation summary. Success criteria included in an evaluation script might include: an XML schema validation with no errors, or that a certain number of objects were created. Thanks to the Landesamt für Vermessung und Geobasisinformation Rheinland-Pfalz for funding this work.